The Academic Technology team has worked feverishly to get our faculty and staff up and running with Canvas, our new course management system that rolled out to campus this summer. While some faculty members may have already engaged in this new system, many will be using it for the first time this semester. Since January, Academic Technology and IT Training, have trained over 400 Canvas users to help them get their courses built. We’ve done this by facilitating departmental training, hosting weekly Canvas workshops, and providing additional learning opportunities through our Canvas Boot Camp and Canvas Nights webinar series. That doesn’t take into account the number of people the Academic Technology team has assisted through personal meetings, help desk tickets and direct phone calls. 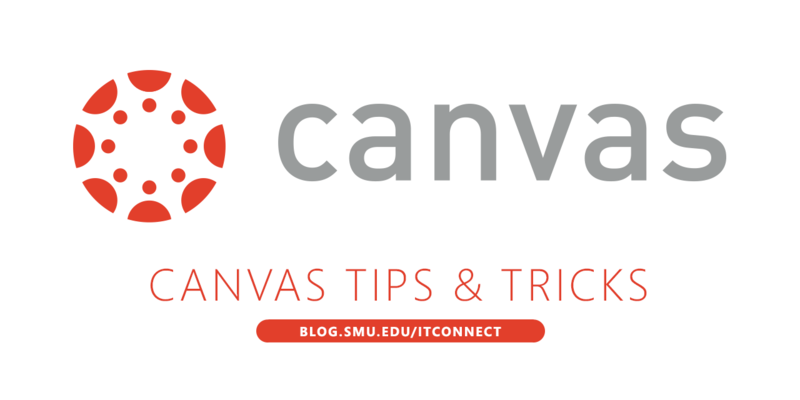 Self-paced: Faculty who prefer to learn on their own may visit the SMU Canvas service page at http://smu.edu/canvas for self-paced tutorials or visit the Canvas website to view the Instructor Guides. 24/7 Live Canvas Help: Stuck on a Canvas question? 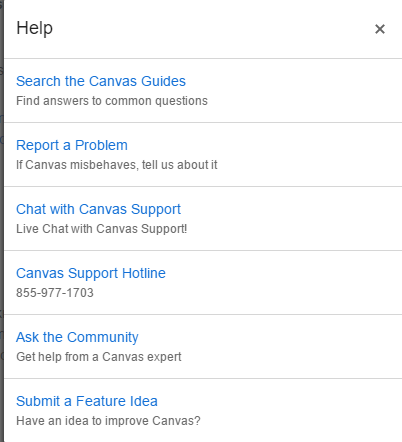 Click on the Canvas help icon within Canvas and select the live chat option. A real-time Canvas support expert will assist you with your questions. Canvas WalkMe! 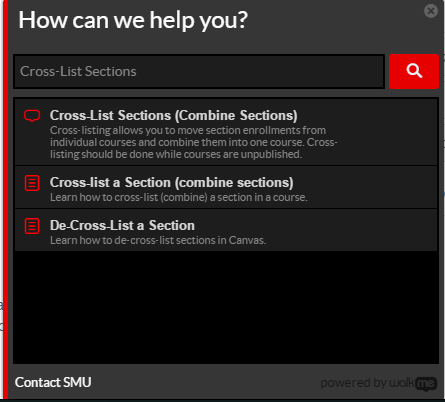 Tutorials: SMU’s new “WalkMe!” interactive walk-through system is now accessible in Canvas. As course instructors have questions when using Canvas, the WalkMe! tool offers a library of walk-through tutorials which will walk instructors through common Canvas course-building steps within the course window. General communications with students about emergencies, class cancellations, etc. If you have any questions, please don’t hesitate to contact us by reaching out to help@smu.edu or 214-768-4357(HELP).